The patent for the telephone is often considered to be the most valuable patent in history. By restricting competition during a time of massive economic growth, geographic expansion and adoption of technology, it provided the monopolistic foundation for the rise of Bell, one of the most dominant brands in American business. That Alexander Graham Bell was even granted the patent is the result of a long series of serendipitous events, much-litigated decisions, and chance. (Telephone Patent Follies is a detailed account). Rapid expansion of the telegraph in the 1870s drove inventors to address the common problem of scalability - how to send multiple signals across one wire. Bell’s solution for sending multiple tones via a wire ultimately evolved into human voice transmission. 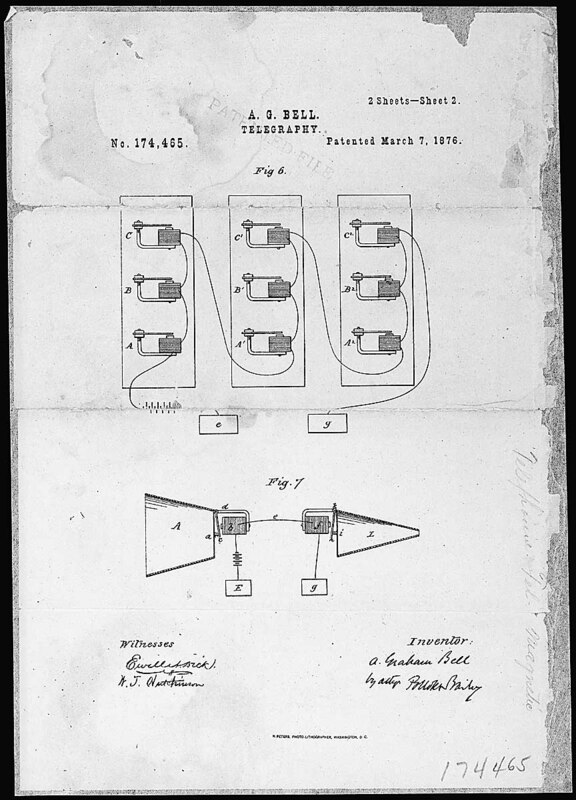 Submitted on February 14, 1876, the patent was granted just three weeks later. Within a year, the patented invention was transformed into a business when seven shareholders incorporated the Bell Telephone Company. In 1878, the first telephone exchange opened in New Haven, CT. In 1899, the Bell Telephone Company was acquired by its subsidiary AT&T, which continued as a veritable monopoly until its forced breakup in 1982. Hughes two-cone drill bit is an invention whose profound effect transformed oil exploration, enabling companies to drill through bedrock and drop holes thousands of feet into the Earth. A century after the patent grant, the invention was designated a Historic Mechanical Engineering Landmark by The American Society of Mechanical Engineers. Until Hughes revolutionized the industry, the history of drilling into the earth had not changed much since the advent of the spring pole method. The discovery of commercial quantities of oil in 1859, however, launched an industry. New methods for searching for oil were needed and the next 50 years saw the gradual development of steam-powered rotary rigs. Cable-tool drilling using fishtail bits worked in soft and sandy soil, but was only marginally useful when encountering bedrock. Enter Hughes, a Harvard dropout drilling for oil in Texas. In 1908, he paid $150 to acquire a roll bit patent that inventor Granville Humason had been unable to commercialize. 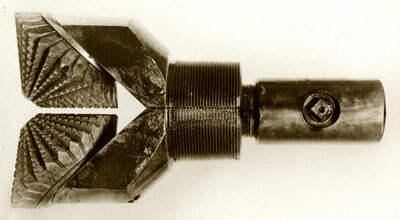 Hughes and partner Walter Sharp improved the design and demonstrated the new dual-cone rotary drill bit in 1909. In front of astonished oilmen, they were able to drill down through 14-feet of hard rock in Galveston Bay, which no prior equipment had been able to penetrate at all. The bit’s ability to crush and powder medium and hard rock ten times faster than any previous bit revolutionized the oil and gas drilling industry. Hughes and Sharp immediately launched the Sharp-Hughes Tool Company, which was inherited by Howard Hughes Jr. in 1924. For much of the 20th century, he was considered one of the richest men in the world. Roller-cone drill bits used worldwide still rely on the design principles introduced by the Hughes two-cone drill bit. The History of Oil climaxed when the salt dome gusher, known as Spindletop, spewed Black Gold 150' in the air! Long before AdWords, Google Glass, Android and self-driving cars, Google’s original vision was to improve the quality of search results. PageRank was developed in 1996 by Stanford grad students Larry Page and Sergey Brin based on the idea of citations. The basic idea was that information on the World Wide Web could be catalogued or ordered in a hierarchy by "link popularity"; the more links a page had, the more popular it was, and thus should be ranked higher. 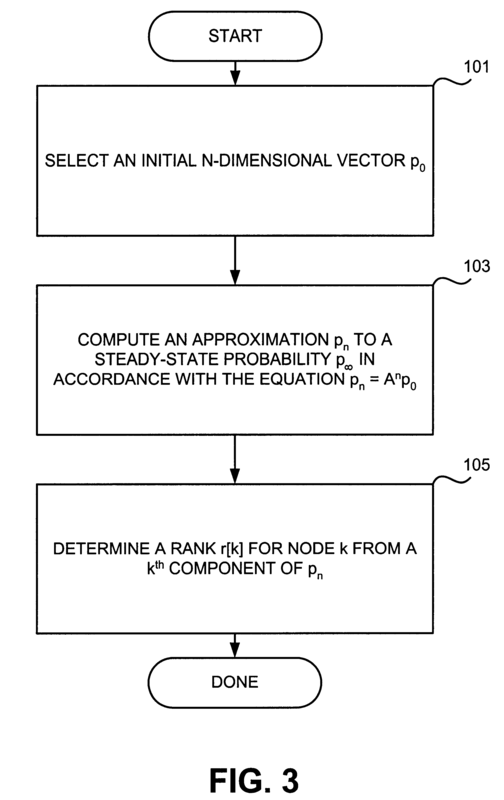 US 6285999 is Google’s famous PageRank patent. An early prototype of the Google search engine was then unveiled in 1998, after which Google Inc. was founded. The greater relevance or “accuracy” of search results soon convinced then-dominant Yahoo! to use Google to provide its search results, and people became habituated to the search results. Google was able to leverage when it launched its own self-branded search engine. While it’s one of many factors that determine the ranking of Google search results, PageRank continues to provide the basis for all of Google's web search tools. The patent is assigned to Stanford University but exclusively licensed to Google. Stanford received 1.8 million shares of Google in licensing fees, which were sold in 2005 for $336 million. Interestingly, a similar site scoring and page ranking method was patented in 1999 by Robin Li, founder of China’s dominant search engine Baidu. The first Gillette razors and blades were ready for sale in 1903. A Gillette Safety Razor Co. razor and one blade cost $5, and 20 replacement blades cost $1. An aggressive advertising campaign and retail distribution model were implemented, which put the razors into local drugstores throughout the country. 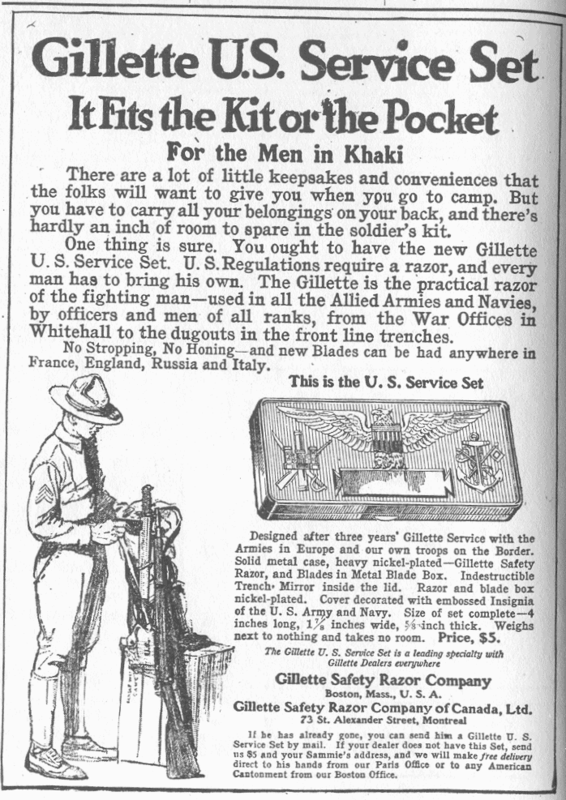 Sales steadily grew until the company arranged with the United States military to provide every enlisted World War One soldier with a Gillette shaving kit. Sales immediately tripled. In 1918, 3.5 million razors and 32 million blades were sold. Gillette’s patent enabled the company, to which he had assigned it and several later patents, to prosecute patent infringement cases against competitors. By the time of is expiration in 1924, Gillette was ready - much like pharmaceutical companies today whose blockbusters drugs are coming off patent - to leverage traction and brand affinity to pursue successful product and pricing tiers, in addition to introducing new category products. “A toy squirt gun which shoots a continuous high velocity stream of water.” A Super Soaker is so much more than this. It’s been the weapon of choice for kids on hot summer days and nights since it was introduced in 1990 with its original Power Drencher name. (The Super Soaker brand replaced it in 1991). 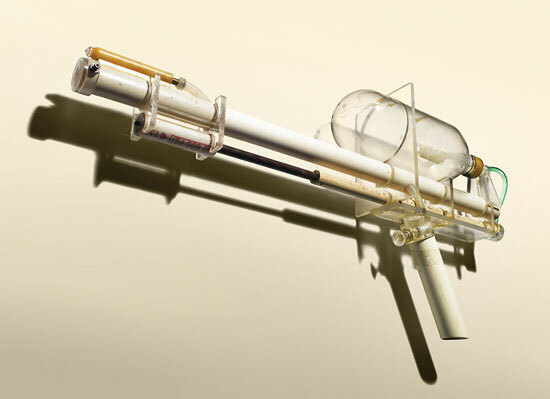 The story of the Super Soaker begins in the mind of its inventor Lonnie Johnson. A lifelong tinkerer, Johnson invented a 4 foot tall, remote-controlled robot in 1968 while in high school, He later worked on the Stealth Bomber program as a US Air Force (USAF) officer, then as a systems engineer at NASA's Jet Propulsion Laboratory on the Galileo and Cassini missions. By 1982, he was back at the USAF and tinkering on the side at night. While working on the design of an environmentally friendly heat pump using xwater instead of freon, he realised the propulsive applications of his design. Commercializing it was a much longer journey. Without the means to produce and distribute it, Johnson pursued licensing. Between 1985 and 1987, Johnson worked unsuccessfully with Daisy to develop a product line. He then signed a licensing deal with Entertech, which lasted until it declared bankruptcy two years later. Despite these false starts, he was able to improve the design-for-manufacture of his prototypes by incorporating blow-molding. Finally, he signed an agreement with Larami Corporation in March 1989 to manufacture and distribute his invention. In its first two years on the market, the Super Soaker generated over $200 million in retail sales, and became the number one selling toy in America. In 1995, Hasbro Corp., the second largest toy manufacturer in the world, acquired Larami Corporation. TIME later ranked the Super Soaker 91 out of 100 on its list of all-time great toys. Overall Super Soaker sales have totaled close to one billion dollars. Lonnie Johnson earned over $100M royalties. The world of shapewear hasn’t been the same since a young sales rep who was then selling fax machines door to door in Florida wanted to look better for a social evening. Inspired, she started working with $5,000 in seed capital on the project as a side gig, researching patents and visiting clothing manufacturers on weekends. Blakely couldn’t afford the full services of a patent lawyer so she visited the Georgia Tech library to learn all she could about patenting and IP. Although she hired a lawyer to write the monopoly claims, she handled the rest herself. Her mother created the patent drawing, and she filed for other IP protections including trademarks and copyright (she even registered her own name). The first patent and early publicity from Oprah created one of the fastest growing clothing brands this century. With an adoring customer base, and total ownership of the company, Sara Blakely was named the youngest self-made woman on Forbes’ 2012 Billionaires List.